I’m typically pretty minimalist when it comes to making art, but when I came across Sara Boccaccini Meadows’ class on botanical illustration in watercolor and gouache, I knew I had to give her more maximalist style a try! This post contains affiliate links. Need more info? Click here! 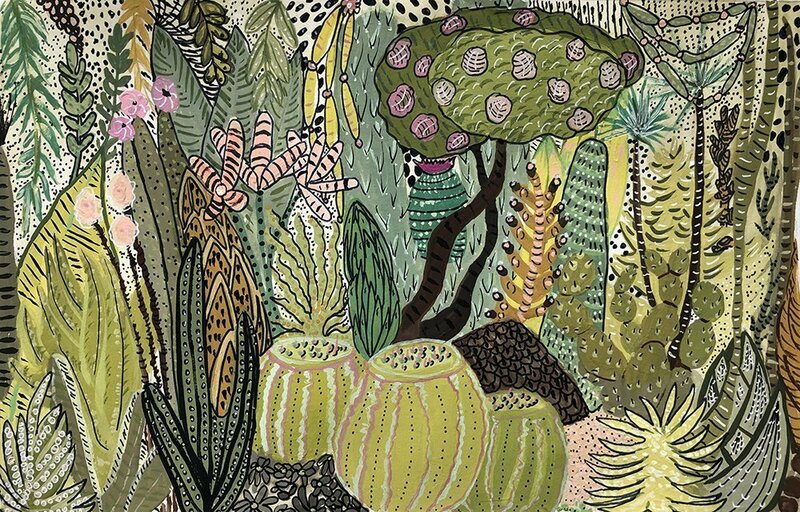 Sara Boccaccini Meadows is a print designer and illustrator who lives in Brooklyn, NY. She is also the author of an awesome book called “Paint and Frame: Botanical Painting: Nearly 20 Inspired Projects to Paint and Frame Instantly“. She’s really an amazing artist with a unique style all her own. 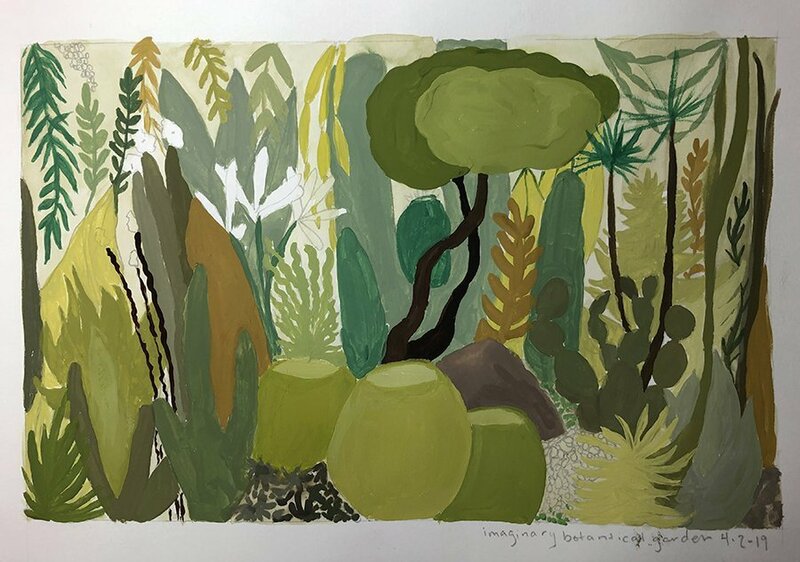 In her class on Skillshare, Botanical Illustration: Paint a Colorful Garden with Watercolor and Gouache, she takes you to a local botanical garden to make your preliminary drawing, and then back to the studio to paint and add all kinds of whimsical details. 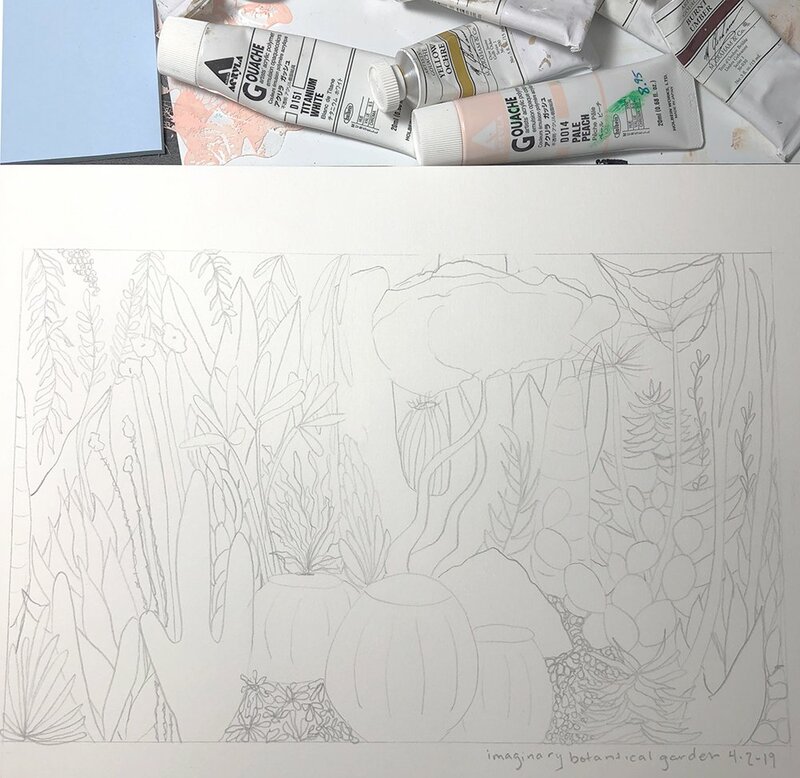 I wasn’t able to visit a botanical garden in person for my project, so I just looked up a few on Google and drew from several different photos of those, using Sara’s practice of not worrying that anything be perfect or exactly how it actually looks. I wasn’t going for realism, just the general ideas and shapes, adding more and more until I filled the frame. Sara teaches to start painting with one color, but for some reason I decided to change the color for each plant as I painted them. I think this was a mistake for a couple of reasons: one is that I think by starting with one color for several plants throughout the piece you end up with a more cohesive look. And the second reason was because, if I had to go back in and touch up a certain plant, there were times when I couldn’t get the color to match just right and I ended up having to re-paint the whole plant. I think it also may have taken me less time to work with one color at a time. At this point it is just a sort of “paint by numbers” feeling, only you choose the colors! (And it made me realize why adult coloring books are so popular!) Watching the video of Sara painting hers at this point in the class is so mesmerizing. Stage Three: adding alllll the details! Overall I’m generally pleased with the final piece — at least as a learning experience and exercise in trying new things! There are parts that I love (like that brownish and pink plant towards the middle-left — it looks like an alien plant to me and makes me smile!) As well as parts that I don’t care as much for (I wish I hadn’t outlined two of the plants on the bottom in black.) Again, it was a chance to learn what I like and what I don’t! I wasn’t trying to create a masterpiece. A couple of other things I wish I had done: Taken a little more time with the initial drawing, as well as taking more time when I was painting. For some reason I kept thinking “Oh, I can/will fix that later!” (Like wonky plants that grew left instead of straight, or leaves I didn’t like the style of.) I should have made it right, right then and there. But the class itself is awesome. I love Sara’s low-key, low-pressure instructional style. I really hope she makes more classes for Skillshare in the future! 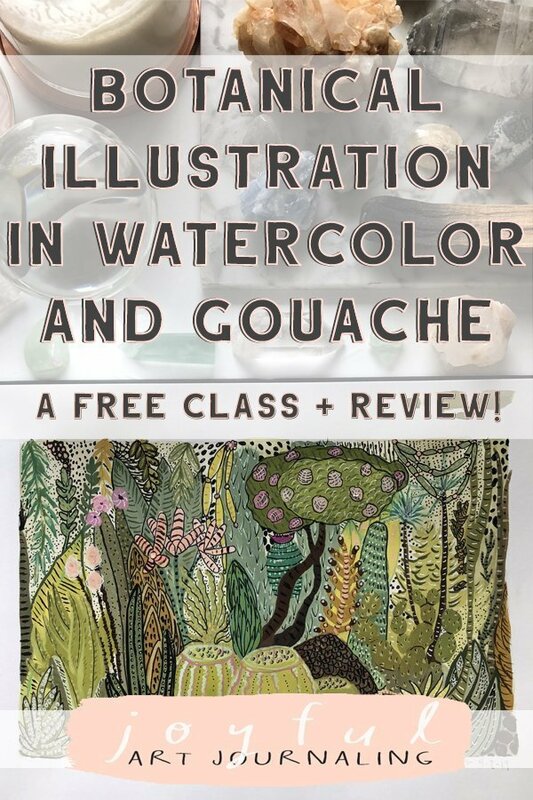 If you’d like to take Sara’s class and learn how to create botanical illustrations in watercolor and gouache and you’re new to Skillshare, you can get a free two month trial through any of the links on this page! Woo hoo!